Be greater than your allergies! Enter the Flonase Sweepstakes 2016 for a chance to win a backyard makeover valued at $30,000! Plus, you could win one of 16 backyard patio package worth $2,500 consisting of patio furniture and a gas grill. All you have to do is to register at FlonaseSweepstakes.com by December 31st and you’ll be automatically entered for a chance to win. This Sweepstakes is open only to legal U.S. residents age 18 or older who reside in one of the following Marketing Regions: Austin TX, Columbia SC, El Paso TX, Houston TX, Jackson MS, Jacksonville FL, Lubbock TX, Miami FL, Orlando FL, San Antonio TX, San Diego CA, Savannah GA, Tampa FL, Tucson AZ, Tulsa OK and West Palm Beach FL. Sweepstakes begins at 12:01 a.m. EDT on November 14, 2016 and ends at 11:59 p.m. EDT on December 31, 2016. Limit one entry per person and per e-mail address. Sponsored and administrated by Dicom Inc./Dicom Promotions, 1650 Des Peres Road, St. Louis, MO 63131. A total of 17 Prizes will be awarded. Sixteen Local Market Prize Winners will be awarded and one Grand Prize from among all entries in each of the participating Marketing Regions. Local Market Prize: One winner from each of the 16 participating Marketing Regions will receive an outdoor package consisting of Patio Furniture and Grill. 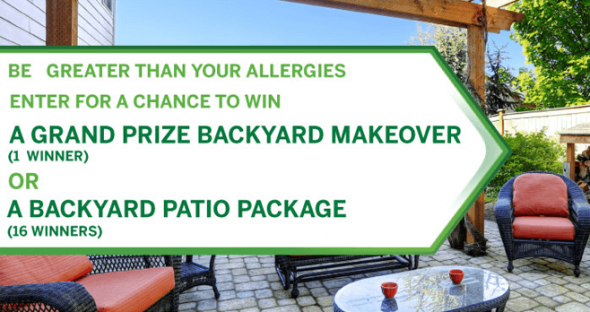 Grand Prize: One winner will be selected from among all of the entries from the participating Marketing Regions to win a $30,000 Fabulous Backyard Makeover. Winner will receive a check in the amount of $30,000 which may be used towards the purchase of a backyard makeover. The approximate retail value of each local market prize is approximately $2,500. The approximate retail value of the grand prize is $30,000. The total approximate retail value of all Prizes to be awarded is approximately $70,000. Beginning on November 14, 2016, you may enter the Flonase Sweepstakes 2016 by logging on to www.flonasesweepstakes.com. To participate, you may be required to register or to otherwise provide some or all of the following information: your name, address, city, state, zip code, telephone number, age, and e-mail address. For more information on the Flonase Sweepstakes 2016, including official rules, visit www.FlonaseSweepstakes.com now!